While on our beach vacation in the Outer Banks of North Carolina in early April I took full advantage of our location just off the beach. In the afternoon the sun was at my back and the birds on the beach and over the water were perfectly illuminated for some nice digiscoping opportunities. Terns, gulls, pelicans, gannets, and ducks all made their way past and all were digiscoped to within an inch of their lives. But none were quite as fun to shoot as Osprey. 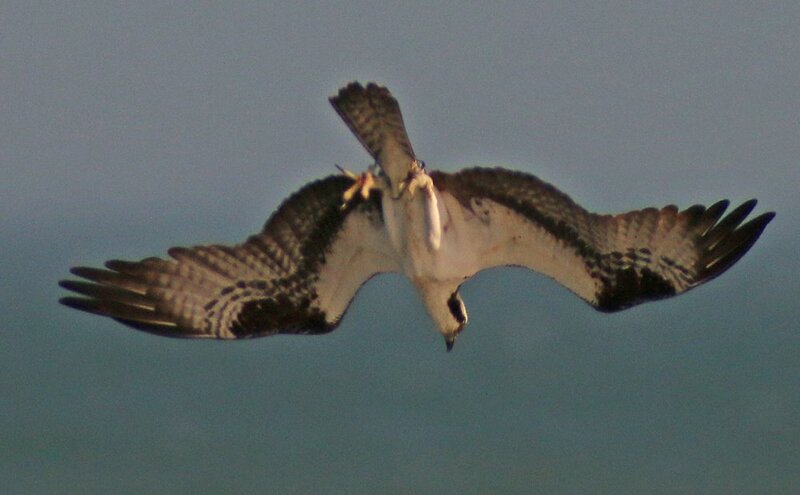 This Osprey flew by particularly closely and I was pleased to get several shots in a row in focus. Whether they were carrying prey, actively hunting, or just flying past I didn’t pass up the opportunity to click away with my Swarovski digiscoping rig and I ended up with some fun shots as a result. My favorite experience was on a day with really strong south winds. 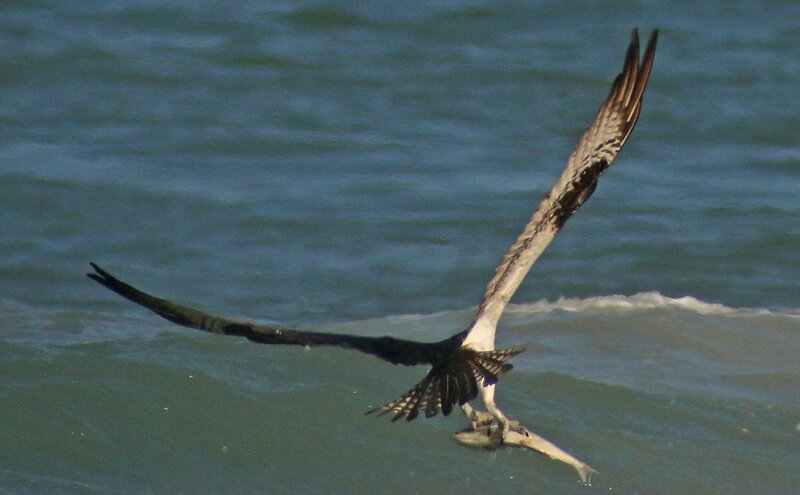 One Osprey made its way into the wind, just off the surf line, obviously hunting. On its first attempt I managed to get a couple shots of it on the way down though it was rather far to my south by this point. Here the bird is on its way down, about to flip its feet down. Note that the feet are already open. And here it’s about to hit the water. Look how close its feet are to its head. Makes it more difficult to miss. On the first attempt it the bird did manage to miss but on the second try it nabbed a fish. Here the Osprey is struggling to get clear of the water, a task made more difficult by the fact that the fish is backwards. When the fish is caught with the tail facing front the Osprey has to spin the fish around to make it more aerodynamic and it has to do so without dropping it. Here the fish has been spun so it is being carried sideways. Almost done! 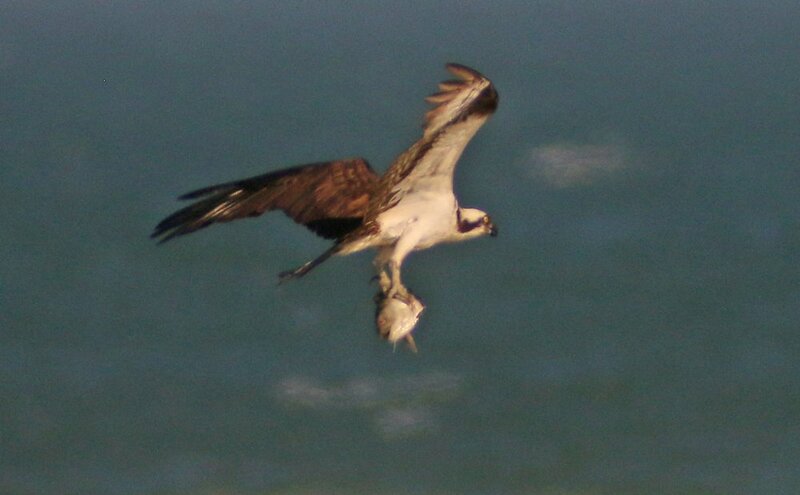 As the Osprey focused on readjusting its grip on the fish the south winds blew it closer and closer to me. Now with the fish in a good carrying position, the Osprey starts to beat its wings again, heading off to the southwest where I assume it has a nest. 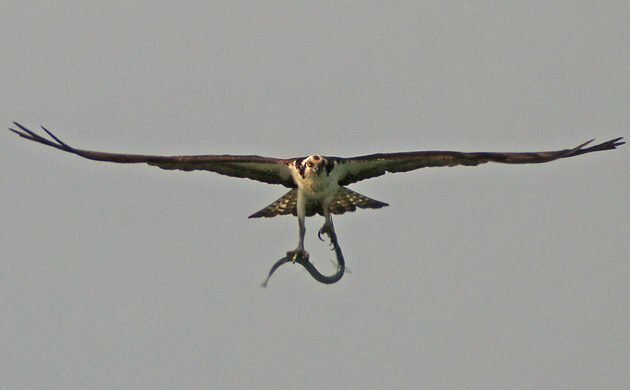 I had always heard that Osprey only carry their fish head-first but I had never seen one actually catch one the wrong-way-round and have to readjust it. It was fascinating to watch and fun to capture through the digiscoping rig. I can’t even imagine catching a fish without the aid of a bunch of tackle, much less hold onto it in strong winds while trying to adjust my grip while flying through the air. 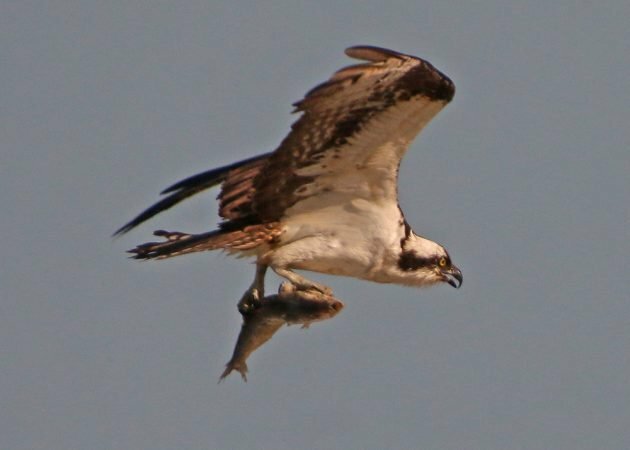 I guess the key is to choose one skill and to focus on it completely and Osprey sure have gotten good at catching fish! 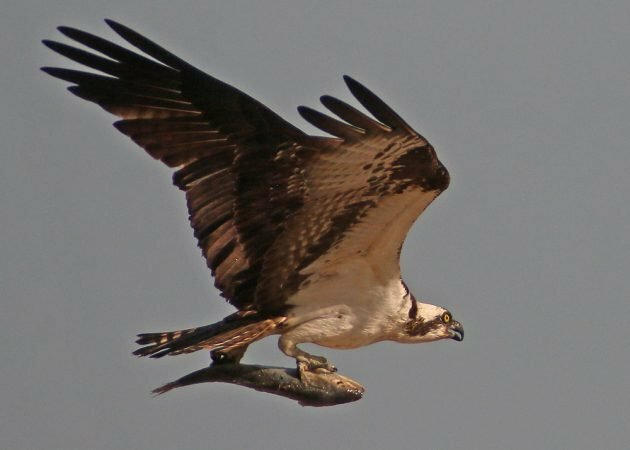 I once observed a flyover Osprey with a flounder in its talons. 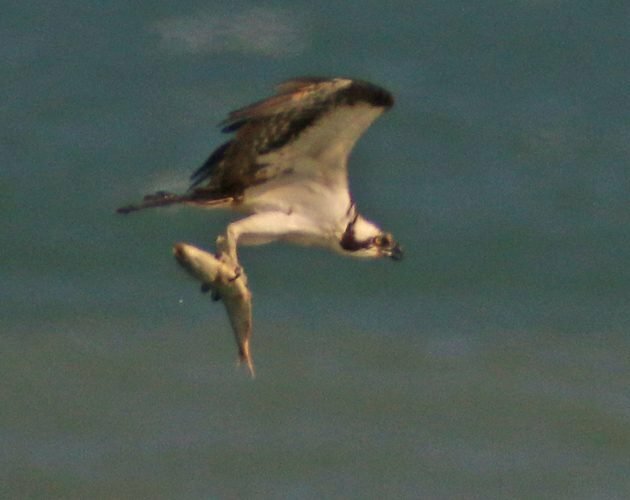 Always wondered how the Osprey caught this bottom feeding fish. Hi Corey, Thanks for the fantastic photos! 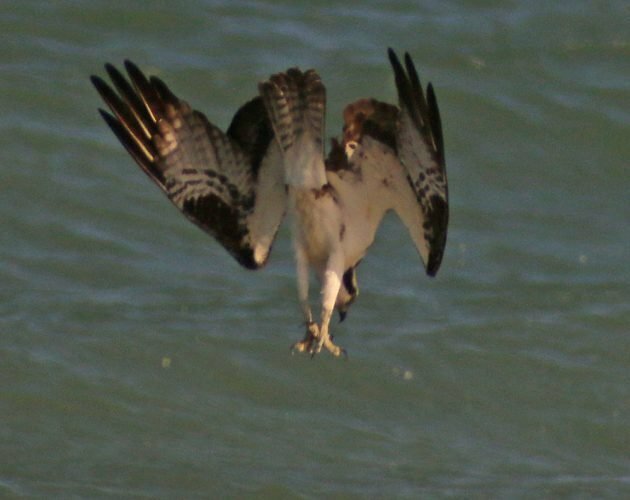 Terrific to see the osprey adjust the fish in its talons to face front. Also, really like the second dive photo. I tried zooming in – did this one have a band on its left leg? Thanks. Trust me, I enjoyed taking them as much as you enjoyed looking at them. And, no, no band. That same photo gave me the same thought but other shots show that it has no jewelry. Thanks. 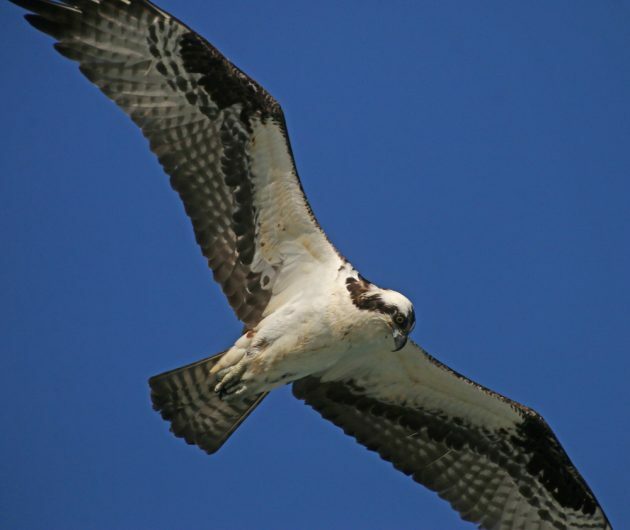 While we are on the subject of ospreys (I’m new to their wonderful world, having only discovered them last year on a nest cam in Scotland), I live in Essex Co. NJ and was wondering if anyone knows where the closest nests are to me? Also are there osprey nests on or near the Delaware River? Thanks. Wow, these are amazing digiscoping shots! I battle to get crisp flight shots with my 50D with 500, f4 lens.. Fantastic bit and great capture! 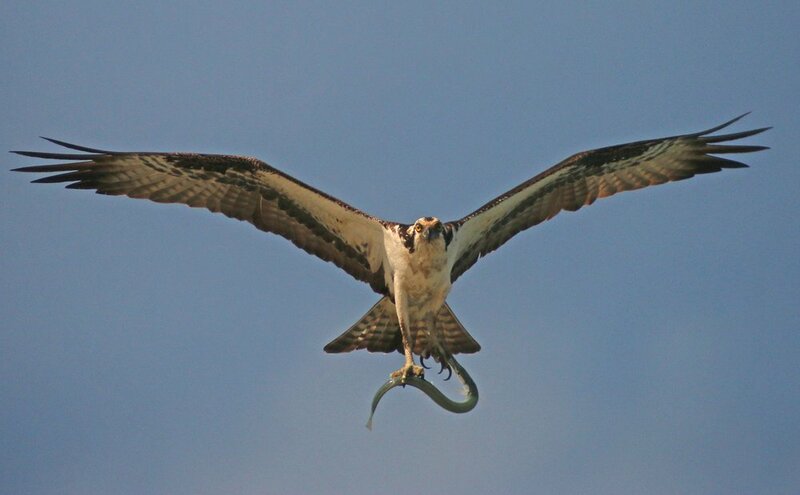 It would not surprise me if the Osprey does this for the purpose of increasing the aerodynamics. When every ounce of effort counts, evolution imprints a strategy that works. Very cool. Really fantastic photo sequence. Wondering, not sure if the Bald Eagle turns their fish captured as does the Osprey, so why the Osprey (maybe because the Eagle is a stronger flyer, or shorter flight time with the fish?). Do You Want a Snack to Tide You Over?